Pictures, thoughts, and details of a 10-day trip from Melbourne to the Flinders Ranges and back. This write-up is a lot longer than I expected it to be when I started. I got a bit carried away. 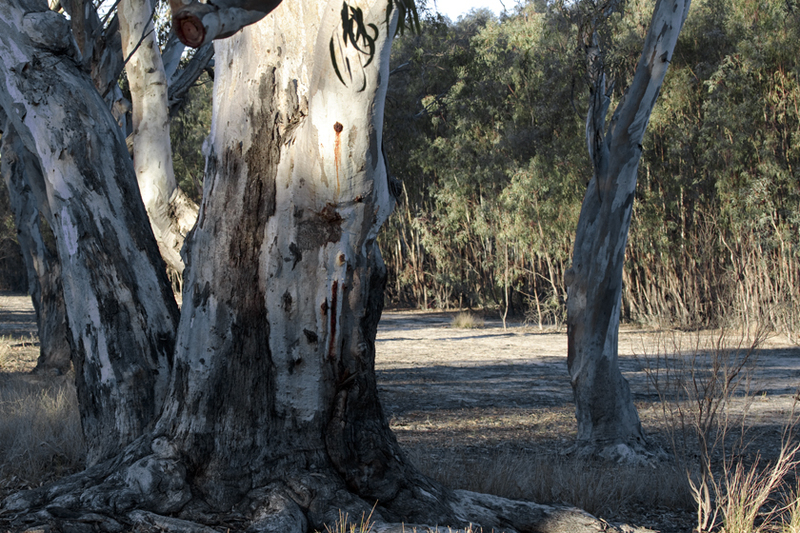 The above photo shows a Galah on an old River Red Gum at Merna Mora Station, west of the Flinders Ranges, South Australia. It always takes much longer to pack than I expect, but we managed to leave home just after 12.30pm. It didn’t matter; we were realistic enough not to plan too long a drive for the first day. Once we were through Melbourne’s sprawl, most of the day’s journey was along Victoria's Western Highway. A late picnic lunch in a park at Beaufort, more than half way to Horsham, was welcome. The sun shone, but the wind was rather cool. Australian Magpies kept us company. Apart from them, along the way we’d seen typical road-side birds such as Galah, Sulphur-crested Cockatoo, Nankeen Kestrel and Black-shouldered Kite (now known more formally as Australian B-s Kite to distinguish it from a similar species found in other countries). 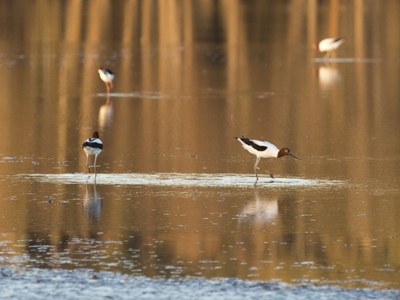 My intention in listing birds seen along the way is to provide an idea of what each place was like. After Beaufort we had wonderful views of the Grampians to the west. It was hard to pass by without visiting, but that could be said for many places. Travelling in winter meant focusing on arriving at the day’s destination early enough to be able to see where we were before the sun set. We managed. Arriving at Horsham at 4.45pm gave us time to unpack what we needed for the night’s stay in our pre-booked cabin and then go for a short walk around the caravan park. 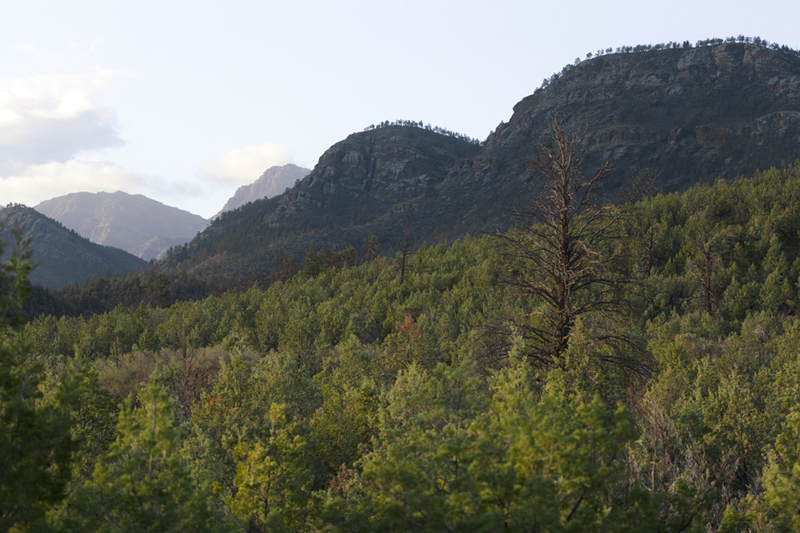 Over the back fence, from the veranda of a nice new unoccupied cabin, we had distant views of the Grampians in soft fading light. Lovely. Birds at the park included Little Corellas, Crimson Rosellas, Masked Lapwings between our cabin and the road, large high-flying flocks of Little Ravens, and of course, Magpies. The night was clear with lots of stars visible and so cold that the dew on the roof of the car froze into an intricate pattern of ice crystals. Our cabin was as close to the highway as any in the park and overnight there were trucks and subsequent noise and interrupted sleep. Apart from that we were comfortable. Next morning we left our cabin before the obligatory 10am, but didn’t leave Horsham for a while. It was a gorgeous blue sky day and I wanted to try for the Bush Stone-curlews that have been seen recently to the east of the city centre near the helipad past the hospital by the Wimmera River. We searched, but did not find them. It was a nice area though, and we did see Australian Pelican, Australian Wood Duck, Pacific Black Duck, Little Pied and Little Black Cormorants, Galah, Musk Lorikeet, Eastern Rosella, Red Wattlebird, Noisy Miner, and Striated Pardalote. On our way through Horsham again, we also saw Silver Gulls and House Sparrows... lots of House Sparrows. Morning tea stop was at Pink Lake on the left of the Western Highway soon after Dimboola. 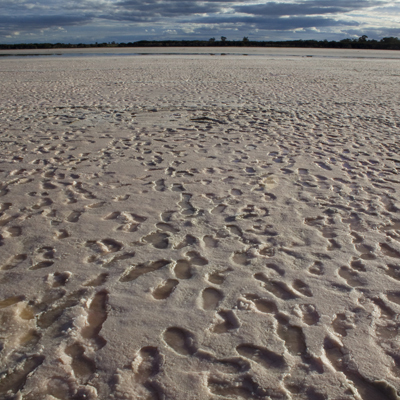 When I visited there in early April this year, the lake was a damp, pink, footprint-covered bed of salt, with only a small pool of water in the middle. This time it was full of water and the pink was mainly confined to the edge. Turning left through Nhill we travelled south west for a short while, then west through the very neat town of Kaniva, at the outskirts of which we were stopped by road works for a time. Such works slowed us down in a number of places during our trip, but it’s good to see the roads are being improved. We will benefit next time we go that way. 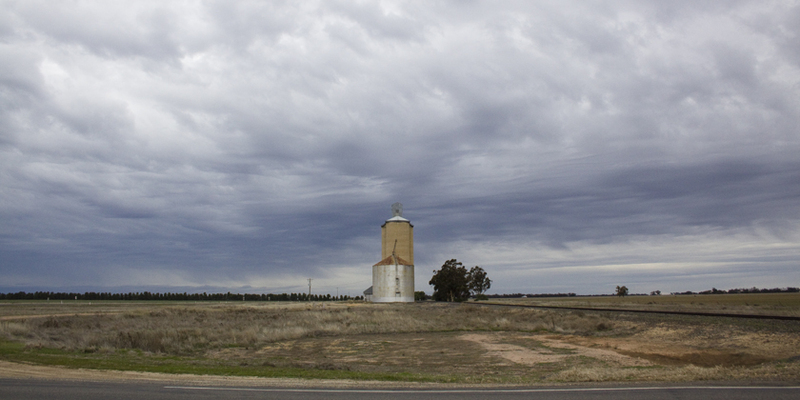 It wasn’t long before we reached the Victorian – South Australian Border. 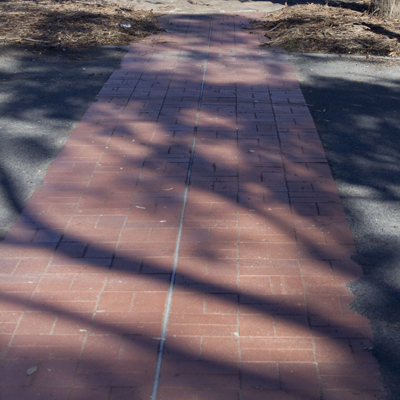 It was marked by a red brick pavement with a narrow grey-blue line down the middle and a special plaque. Two inquisitive, but nervous little dogs hovered around us as we ate our lunch at a convenient table. We finished all our remaining fruit and salad vegetables before proceeding across the border, as fresh produce is not allowed to travel between states in private cars. These foods would not have been much good to the waiting dogs. 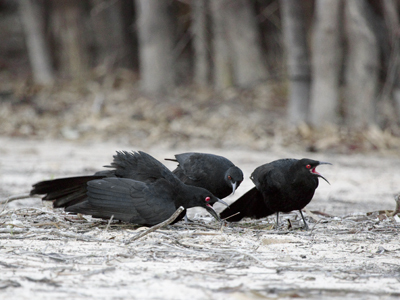 A flock of White-winged Choughs fed on whatever they could find on the ground of the car park and surrounds. Other birds there were Galah, Eastern Rosella, Noisy Miner, Australian Raven and Australian Magpie. The road ahead into South Australia looked much the same as Victoria's Western Highway, but it was now called Dukes Highway as far as Tailem Bend. 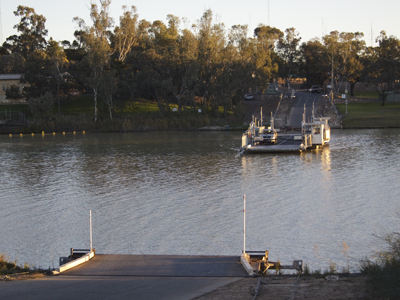 After Bordertown, Keith, Coonalpyn and Coonandook, we reached Tailem Bend and our first sight of the marvellous Murray River. We stopped at the Information Centre, which was also a historic railway station and museum. The extremely helpful attendant told us all we needed to know about South Australian attractions, provided us with lavish brochures and, most importantly, showed us the most direct way to Gawler, our destination for the day. The drive through Murray Bridge, which lived up to its name very well, Palmer, Mt Pleasant, Mount Crawford Forest Reserve, the historic Williamstown and beyond was very interesting and also challenging with its various turns and ups and downs, road works, and facing straight into the descending sun. More than once we had to stop completely as the sun temporarily blinded us over the crest of a hill or around a corner. We were afraid that we would be late at our booked accommodation and rang ahead to say we were on the way. It was later still that we realised we had an extra half hour because we were now under Central instead of Eastern Standard Time. Some of us are a bit slow... which in this case made us fast! We arrived in plenty of time. This was an amazing sunny day of changing environments along the road, with farm paddocks showing new green growth or holding flocks of sheep, various woodlands, heathlands where grasstrees were topped with old spent flower spikes, and interesting-looking towns. The more obvious birds that we saw along the way included Galah, New Holland Honeyeater, Raven, Magpie and Willie Wagtail. Our cabin in the caravan park at Gawler was near a main road again, but we were assured the traffic would be quiet at night. It was. Before we settled in we did a short walk of the park and found it pleasant. Birds around the park included Crested Pigeon, Rock Dove, Laughing Kookaburra and Common Blackbird. That night we played the first of our nightly games of Scrabble, a holiday standby. Another blue sky sunny day with a set destination and lots to do along the way. 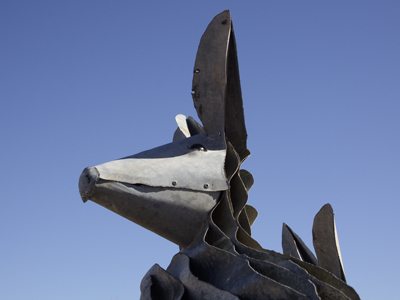 Our first main stop was Burra where we made purchases at the Visitor Centre, which stocked art and craft works. Most particularly we bought greeting cards by the painter Allyson Parsons http://www.allysonparsonsart.com/. Her paintings have a rare touch and special quality that beautifully capture and express the feeling of the subject, which can be anything from a landscape to an old car or a simple broom. 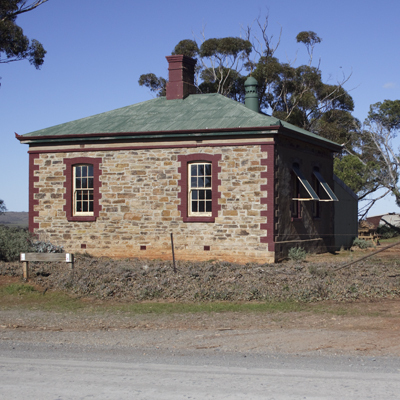 Burra boasts many well-maintained, grand old stone buildings. Morning tea in a park near a row of old mining cottages, now holiday accommodation, made us want to return and stay one day, but we had planned other adventures for now. At Burra we saw Pacific Black Duck, Eurasian Coot, Dusky Moorhen, Galah, Eastern Rosella, Red Wattlebird, White-plumed Honeyeater, Welcome Swallow and Common Blackbird. There would have been sparrows, too I think. We certainly saw them along the way in the morning, as well as other usuals such as Black-shouldered Kite, Nankeen Kestrel, Galah, Australian Magpie, Raven, Magpie Lark, and Willie Wagtail. 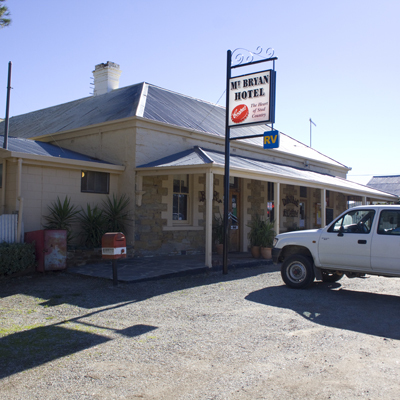 Next stop was the pub at Mt Byran to collect a key to a restored homestead at Mt Bryan East. Thus began a 50km round trip detour into a part of the lives of two men: one an adventurer and the other a surveyor. The adventurer was Sir Hubert Wilkins (1888-1958) http://en.wikipedia.org/wiki/Hubert_Wilkins. Amongst other endeavours, he travelled widely throughout the world, was a polar explorer, a pilot and a photographer, conducted an expedition to facilitate the collection of meteorological data, studied birds of northern Australia, was critical of how Aboriginal people were treated, and was aware of environmental degradation. As a boy he attended Mt Bryan East School and lived in a house over the paddocks a few km to the north. We visited both. 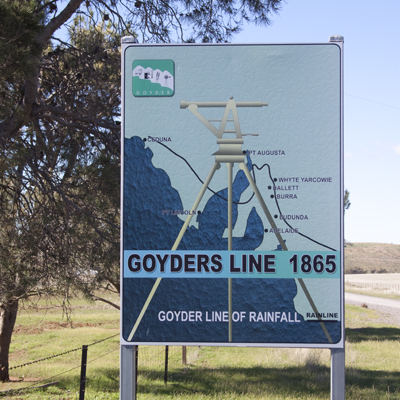 By the road opposite the school was a sign referring to Goyder’s Line, which indicates a north-south environmental divide across South Australia stretching from Ceduna in the west to Blanchetown in the east http://en.wikipedia.org/wiki/Goyder%27s_Line. In 1865 surveyor George Goyder declared that to the north of this line there is insufficient reliable rainfall for the growing of crops. Farms where this advice was ignored failed. After this side track, we returned the key to the Mt Bryan pub, which reminds me of the phenomenon we saw on the way there originally. 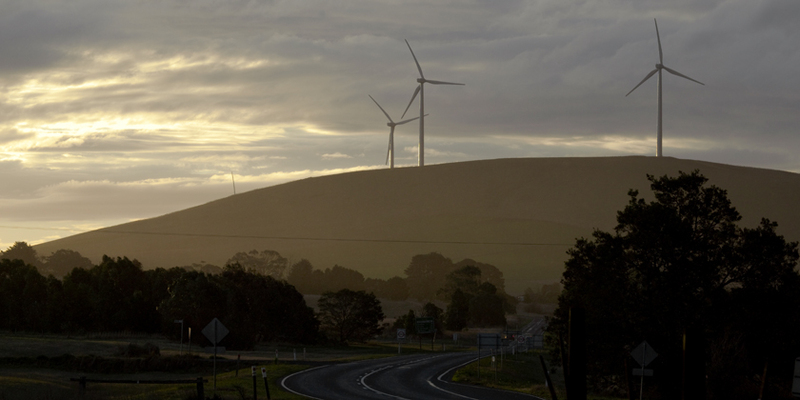 We were watching the nearby wind turbines apparently lazily rolling over the tops of the hills to our left when we noticed glistening narrow one-metre-long white lines flowing sideways and perpendicularly from the power lines suspended high above the road side. They looked like long blowing fringes of cobweb and were extraordinary. Now we were in a hurry. It was already 2.45pm and we had another 263.7km (though we didn’t know it so precisely then) to go to Merna Mora Station with a stop at Hawker on the way for petrol if we made it there before they shut. No more stopping until we reached Hawker. Any photos would have to be taken on the way back. We arrived at Hawker just after the Petrol Station on the highway closed for the day. Was that the only one? Thankfully, no, and the other one was still open, just. We rang ahead and told the Merna Mora people we were still on our way. The Hawker people told us to take it slowly from now on because it was after dark and there would be kangaroos on the roads. We did and there weren’t and all was good. Our flat at Merna Mora was ready and waiting, nice and warm. By now it was 6.25 pm and we had travelled 1220.8km in three days. Phew. While out of contact with the rest of the world we missed the news that Australia has a new Prime Minister. Julia Gillard is out and Kevin Rudd is in. Time for another game of Scrabble. We’re missing 4 letters: A, I, N, and O.
Merna Mora Station was all we had hoped it would be. Fantastic place. Even the weather was perfect. Every day. Each morning of our stay at Merna Mora, I walked for an hour from sunrise, before breakfast. 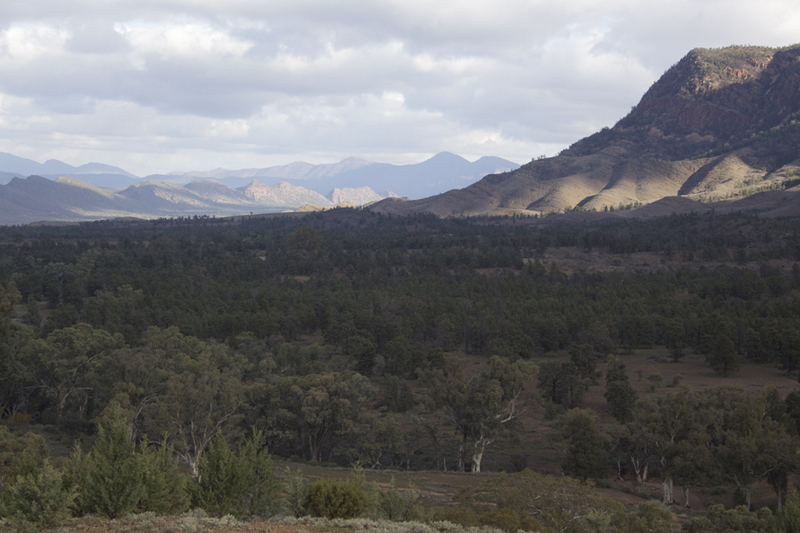 The long expanse of the western side of the Flinders Ranges was magic in the early light. One of the bird species observed near the creek during our stay was the Australian Ringneck, which here, I was told, is a cross between the Murray Ringneck and the Port Lincoln Parrot. 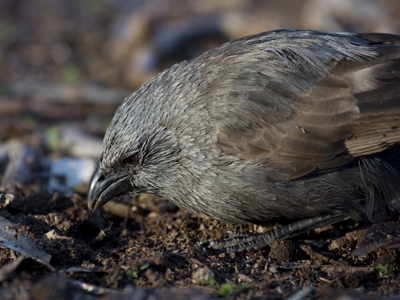 Some of the other easy-to-find species were Little Corella, Galah, Crested Pigeon, Spiny-cheeked Honeyeater, Grey Butcherbird, Black-faced Cuckoo-shrike, Magpie-lark and the constantly boisterous White-browed Babbler. Domestic chickens housed opposite our unit were accompanied by several hungry House Sparrows. Australian Ravens were ever present. Merna Mora caters for walkers with three main tracks, simply called walks 1, 2 and 3. On our first day there (28 June), we began with walk number 1 to the north of our unit. 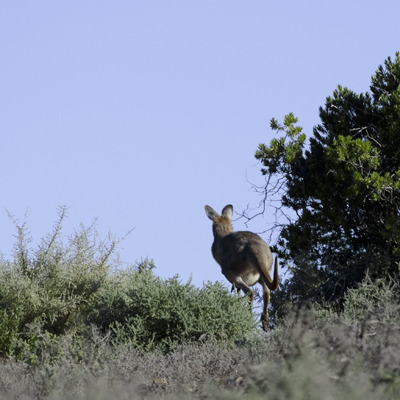 This ran near a fleeing kangaroo, across a runway, past the neatest rubbish tip in the world, through a cattle paddock where there were White-winged Fairy-wrens and a Red-capped Robin, across a small, mostly dry creek, then up a steeply rounded, rock-strewn, saltbush-covered hill to a cairn and a spectacular view. 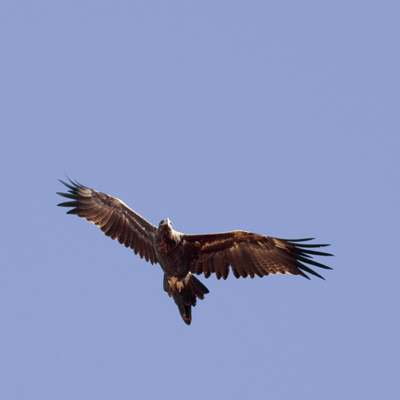 Wedge-tailed Eagles flew high overhead and the Station was all around us with the Flinders Ranges on one side and Lake Torrens in the distance on the other. 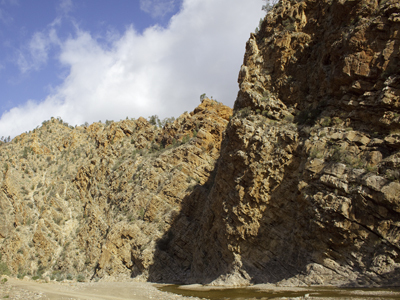 One of the self-drive 4WD adventure tours offered goes to the Lake, a round trip of 96km. 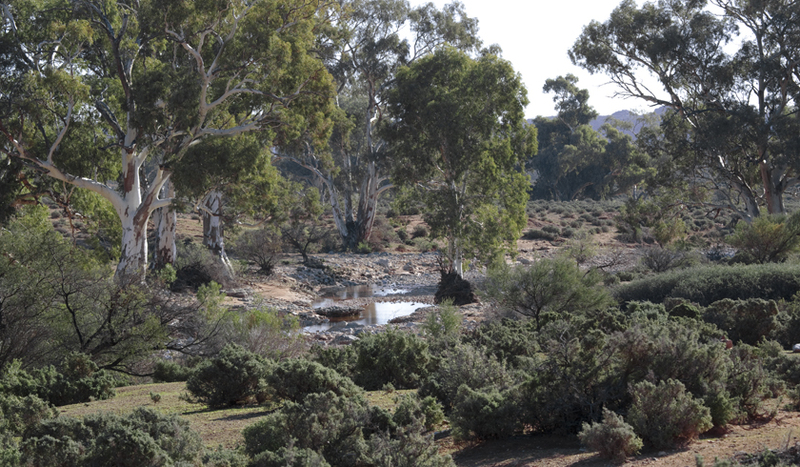 After lunch on that first Merna Mora day we drove a few km to a lookout near the Leigh Creek / Hawker Road, south of the Moralana Creek crossing, where we expected to have mobile phone access, but it was not to be. We retraced our steps, or wheel tracks, a short way then drove east along Moralana Scenic Drive as far as Black Gap and the Heysen Trail. This 1,200km walking track extends from Cape Jervis on the Fleurieu Peninsula in the south, to Parachilna in the Flinders Ranges to the north. 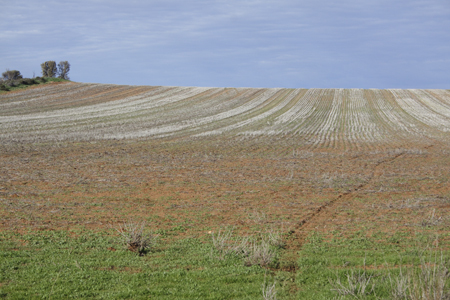 We had already come across the Trail at Burra and Mt Bryan along our way yesterday. The creek at Black Gap was running quietly and everything looked eerily pink. Softly, pinkly beautiful. Sunset almost coincided with our return to our accommodation. We spent a lot of time driving into the sun on this trip. What we lost in visibility we gained in awe. 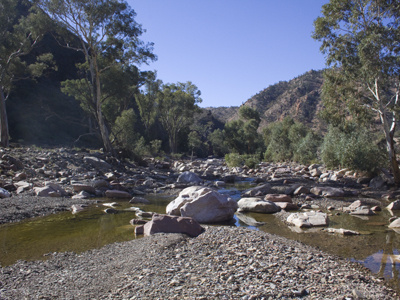 Most of the next day (29 June) was absorbed by an excursion to Wilpena Pound, known to the local Adnyamathanha people as Ikara, meaning ‘meeting place’. Merna Mora Station extends all the way up to the western rim of the Pound and the distance from our unit to the Pound Resort, as the Australian Raven flies, would be less than 20km. Travelling as we did via Hawker, the distance was close to 100 km, though returning later via the Moralana Scenic Drive, half of which we already knew, was only about 60. The long way around was no effort, afforded excellent views of the Ranges and yielded our first Emus for the trip. A stop at Hawker on the way also allowed us to collect invaluable information about the area. In particular, the 204-page book Explore the Flinders Ranges, edited by Sue Barker and others, was well worth the $20 we paid. 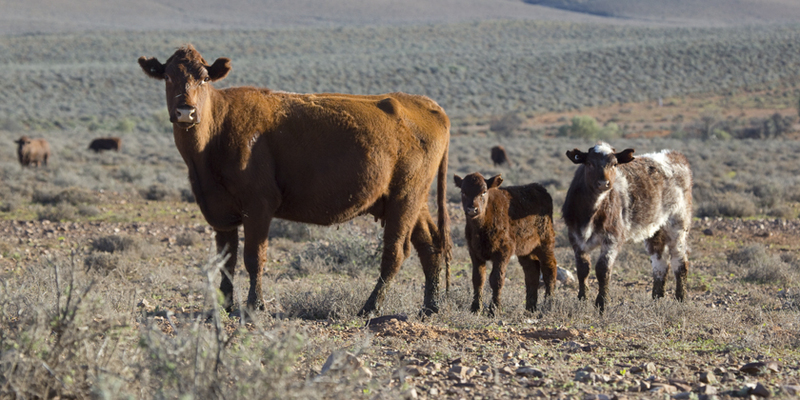 We also posted the Allyson Parsons greeting cards that we had bought at Burra. Impressively they arrived at their Victorian and Tasmanian destinations before we returned home. This did not accord with some previous experience and at least one of the recipients suspected it was due to a break in the rules of space and time. Looking back now, and examining the photos we took, it was indeed like being in a different world. Wilpena Pound Resort seemed very busy and commercial. I would prefer it if such places were built outside National Parks. Parks are there to protect nature, not to provide built accommodation, food and giftware for people. It would be better if such amenities were confined to nearby existing towns instead and to Stations such as Merna Mora. 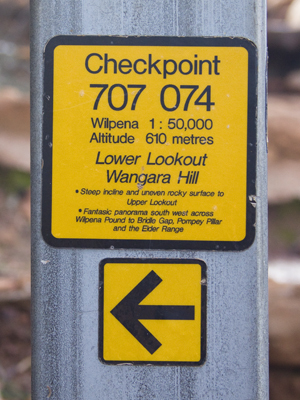 However, we soon left the Resort area behind as we followed the coloured signs along the walking track that led us to the Hills Homestead and the Wangarra Lookouts on Wangara Hill. I did not notice the spelling anomaly until now, which is just as well as I was on holiday at the time and part of my work involves correcting students’ reports, including their spelling. It is possible that there is more than one way to spell the name. 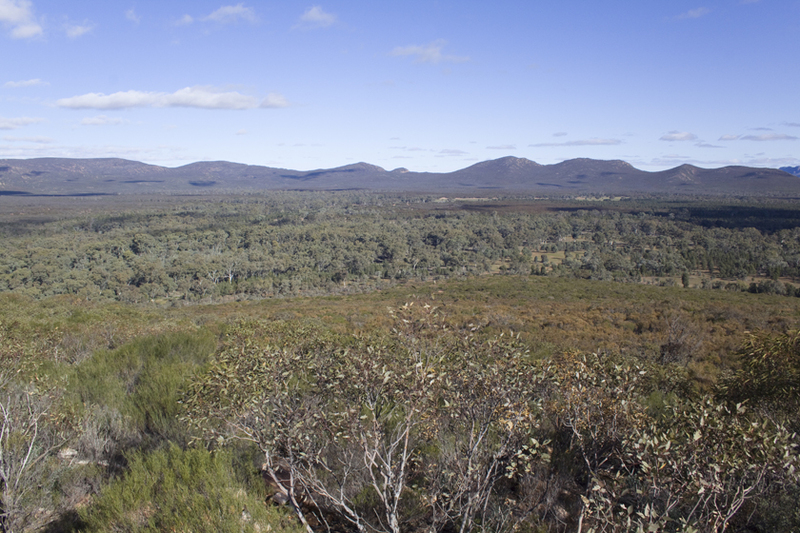 In Victoria Ballarat used to be Ballaarat and Lillydale Lake is in Lilydale, so in the Flinders Ranges Wangarra Lookouts are on Wangara Hill. 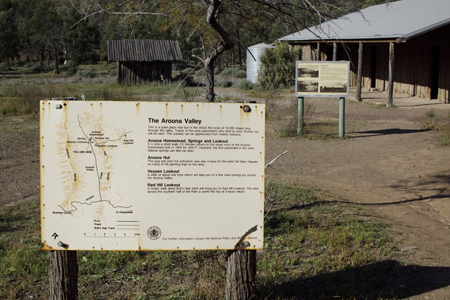 There were several information notice boards along the way beside the track and some very intelligent feral goats. They could obviously read and write, as the signs were written in the first person from the perspective of the goats themselves. Also, the only place we saw them was near one of the goat notices. Seriously though, we were disappointed with the type of language used on this notice as it trivialised the problem of feral animals in national parks. Similarly, some of the other notices that we read used simplified, first-person language from the perspective of frogs or children from the past. Presumably the signs were aimed at children of the present, but surely a young person would learn more from a well-written sign that respected their intelligence. In contrast, most information signs that we saw in other parts of the Flinders Ranges used appropriate language and were very informative. We learnt much about the geology and history of the area from them. 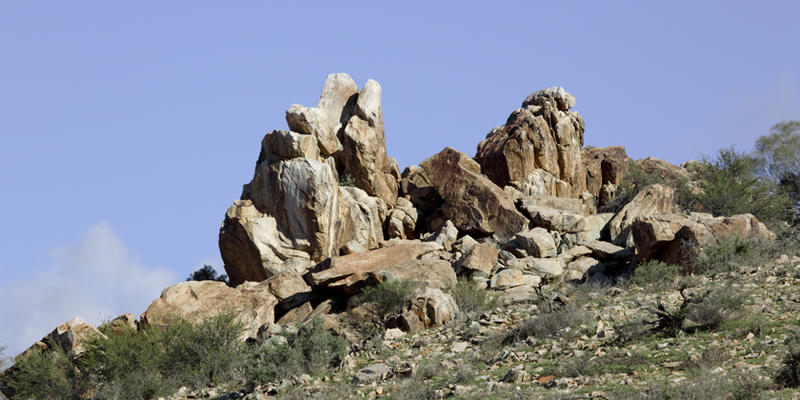 After reading signs, taking photos and looking at everything about us as we walked, we eventually arrived at the old stone Hills Homestead then climbed to the nearby Lower and Upper Lookouts for impressive views inside the Pound. The walk itself was very interesting, but these views made it even more worthwhile. Aware that much time had elapsed while we were walking and admiring the views, we increased our pace three-fold on the way back to the car as we wanted to return to Merna Mora before another winter sunset. We made it home, as we now called it, just after sunset, but still with enough light to see our way. 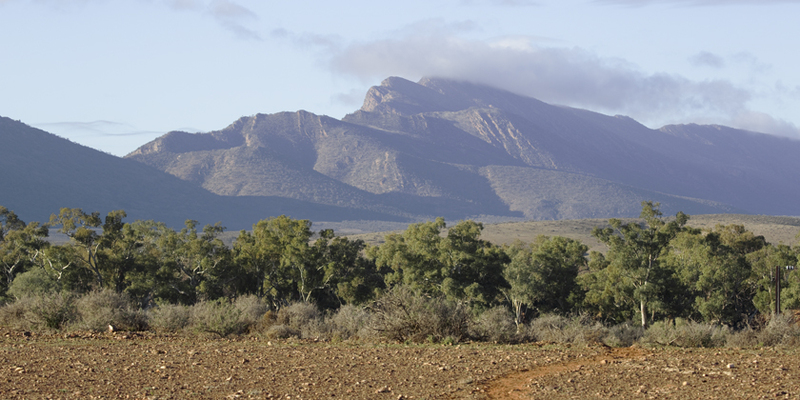 The birds of the Wilpena Pound area included Australian Raven, Australian Magpie, Grey Butcherbird, Laughing Kookburra, small birds such as Inland Thornbill and Mistletoebird and a large group of Apostlebirds that foraged around my feet as I took numerous photos. 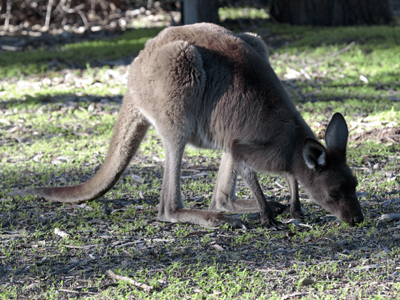 Western Grey Kangaroos were also present and not at all disturbed by the presence of people. 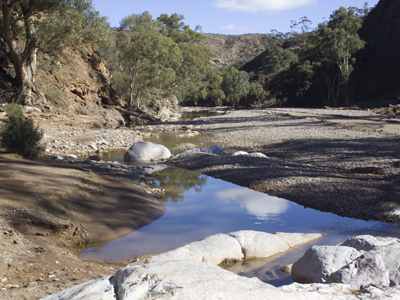 On our third day staying at Merna Mora (30 June), we drove north then east to see the not-to-be-missed Brachina Gorge and Aroona Valley. 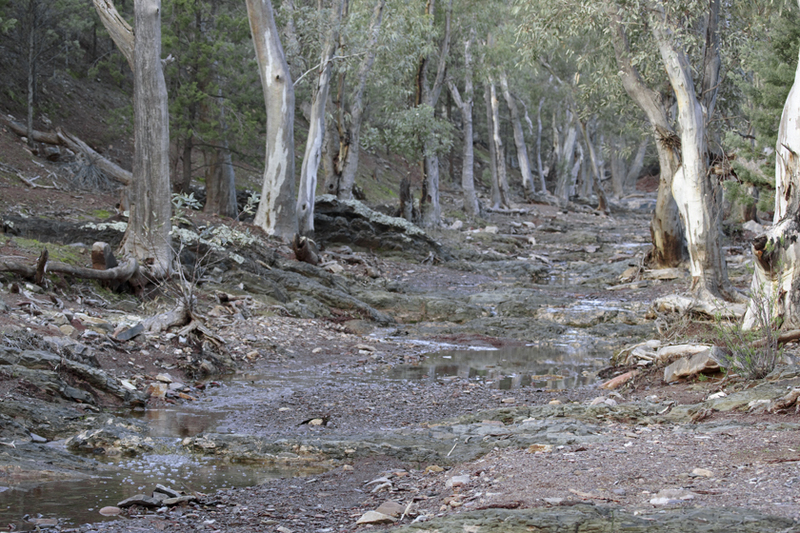 The recent rains meant that water flowed along Brachina Creek and therefore along the road in the several places where creek and road shared the same path through the Gorge. Birds we saw here were Striated Pardalote, Mistletoebird, Australian Ringneck and White-plumed Honeyeater. 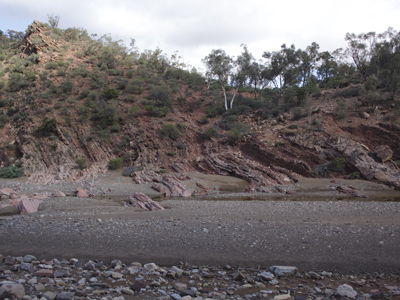 Brachina Gorge is a place where geological history is clearly revealed by the various folded layers of different rock types as well as the exposed fossils, all nicely signposted so we knew what we were looking at. The signage is indeed brilliant. 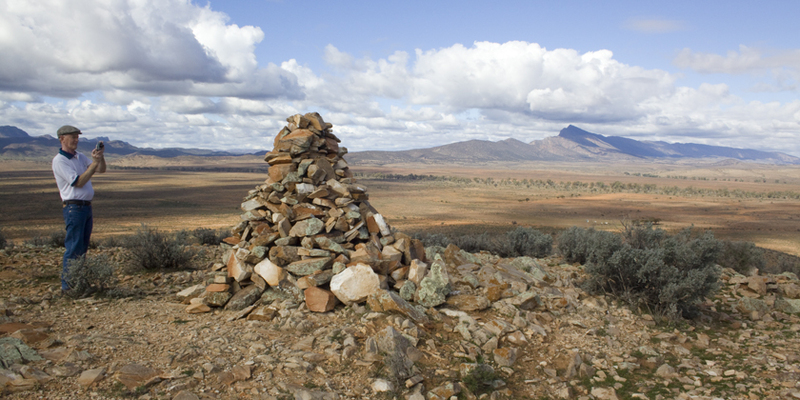 I was stunned to realise that the rugged Flinders Ranges are mere stumps from the base of once huge mountains that towered above their present height. Through hundreds of millions of years of weathering, the missing mountain tops are now spread over the surrounding rocky plains. When you see the geological cross sections on the signs and also in the book Explore the Flinders Ranges, it all makes sense. 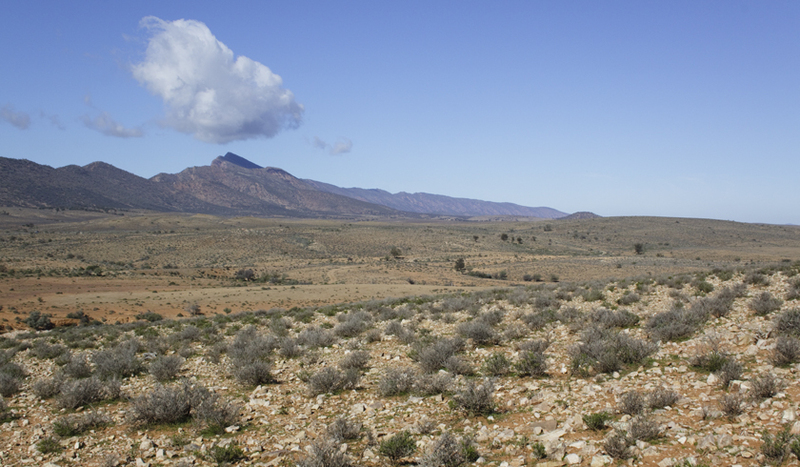 With this knowledge, when viewing the ranges from a distance, as from the west along the Leigh Creek / Hawker Road, you can see how the lines of the present remaining peaks and ridges lead the eye to reveal where the high mountains once stood. A turn to the north from Brachina Road took us to the green and peaceful Aroona Valley. 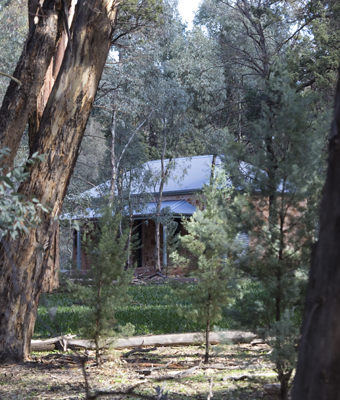 Here we met the Heysen Trail again and ate a late lunch near the native-pine Aroona hut where Sir Hans Heysen (1877 – 1968) himself used to stay when he painted in the area. 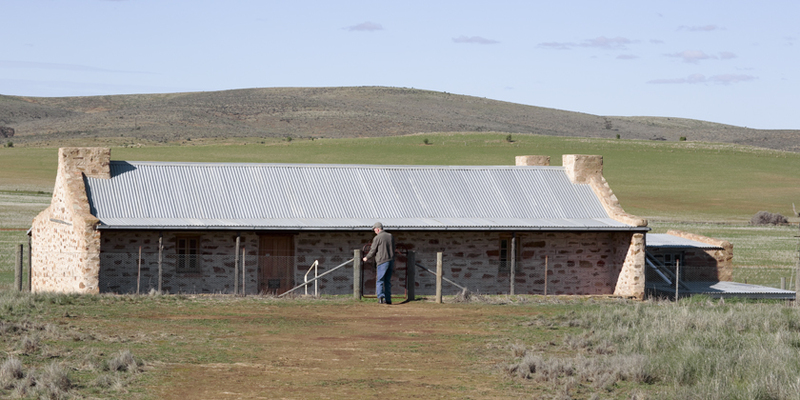 We climbed the hill behind us for more views of the valley and to find the stone ruins of the Aroona Homestead, owned in the mid 1800s by pastoralist John Hayward. Returning the way we had come, through Brachina Gorge, we again stopped to look for fossils and wonder at the rock formations in the late afternoon light. Another drive into the setting sun took us back to the Leigh Creek / Hawker Road and a spectacular sight of an old stone building bathed in late light on the western side of the Ranges. This is where we could follow the lines of the peaks to imagine the previous awe-inspiring height of the ancient mountains. Our fourth day at Merna Mora (1 July) was devoted to walking. There would be more than enough driving in the next few days as we headed back towards Melbourne. 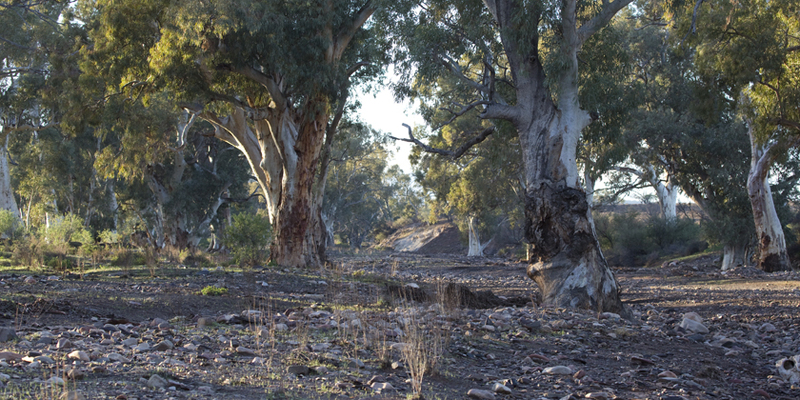 We chose to combine parts of walks 2 and 3 to the south of Moralana Creek where we would see where the old Ghan railway once ran, evidence being a few weathered sleepers and odd bits of railway metal. 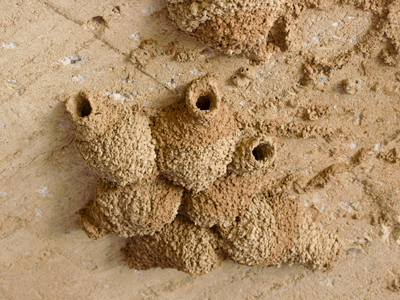 Culverts beneath the rail track sheltered last year’s Fairy Martin nests together with a few very small Mud Wasp nests. Near the culverts was a large curve of the not-completely-dry Ilka Creek and some Chestnut-rumped Thornbills. During the day we also saw Mistletoebird, Red-capped Robin, Striated Pardalote, Spiny-cheeked Honeyeater, Willie Wagtail, Australian Raven and Wedge-tailed Eagle. Near the culverts and the Ilka we looked for the remains of old, stone lime kilns that were used in conjunction with the railway, but we did not find them. 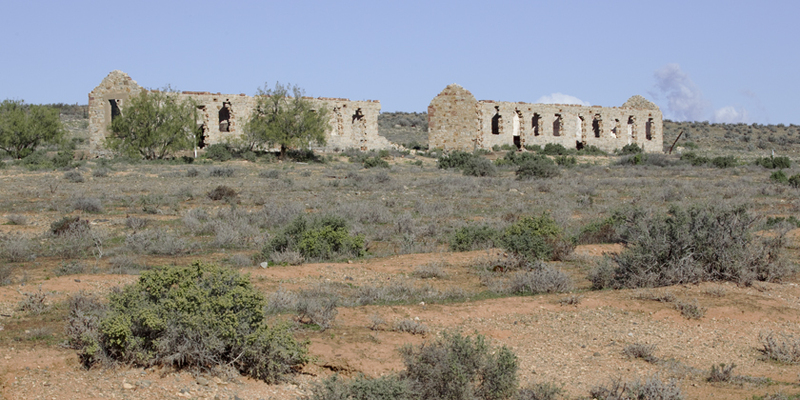 Our goal was to reach the disused old, stone Mern Merna School and railway station buildings. Quite early in our walk we could see the two structures in the distance. After we arrived, we spent some time looking around and thinking of what it might have been like when the railway was running here and the buildings were new and inhabited by people. The school opened in the 1880s and was used until 1955. 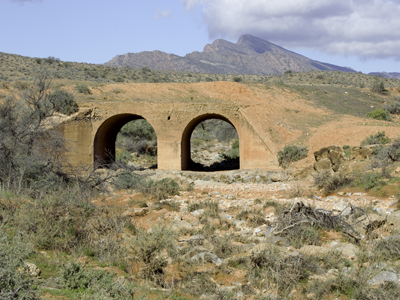 The railway line was active for a similar time period. 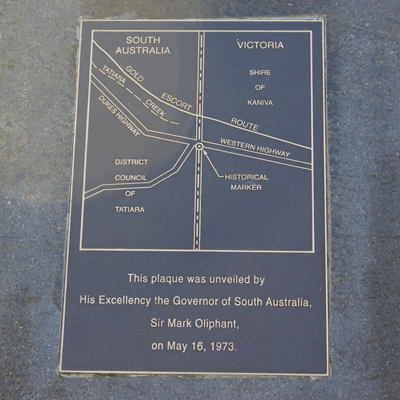 A new line further west was opened in 1956 and yet another west of Lake Torrens in 1980. Currently the Ghan Railway operates between Adelaide and Darwin. Our return walk took a slightly different route. We passed an outcrop that we called Stegosaurus because the rocks stuck up like sails on a large prehistoric creature. Every day at Merna Mora the weather was beautiful, but today was even more so; perfect for walking, sunny and not too hot or cold. 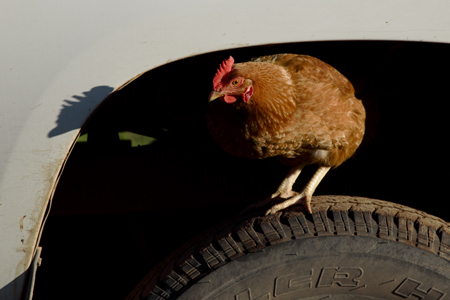 Back at our accommodation by late afternoon, the friendly domestic chooks came to greet us, one jumping onto a wheel of our car. For once I had first turn in the night's Scrabble game. My letters were ZQAAAIE. I passed. Days 8 to 10: ... the way home. My morning walk was shorter than usual so that we could pack everything into the car and leave our unit clean and tidy by 10am. For the last time, we drove west along the 3.3km Merna Mora entrance road, then turned south for the three-day trip home. 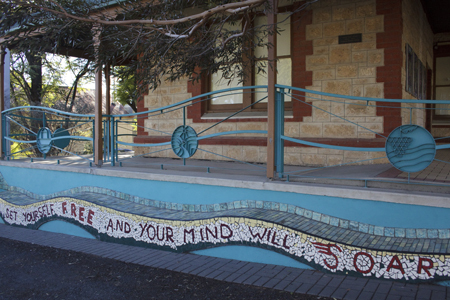 After a petrol stop at Hawker, we ate morning tea at a tree-shaded picnic table in the middle of the main street of the friendly town of Orroroo (accents on first and last syllable – we asked a local). 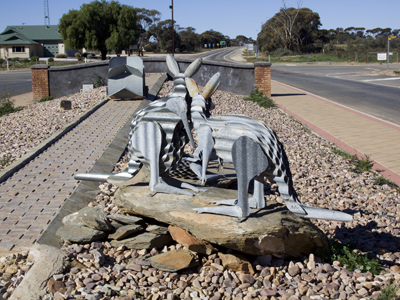 The main reason for stopping here was to look at and photograph the corrugated-iron kangaroos near the southern entrance of this well-kept town. Unexpectedly, we also saw a Black Kite and somewhere north or south of Orroroo there were Emus in a paddock by the road. After a slight detour past Peterborough and 141km further on we stopped at Burra for lunch. Again we determined to return here and stay before long. 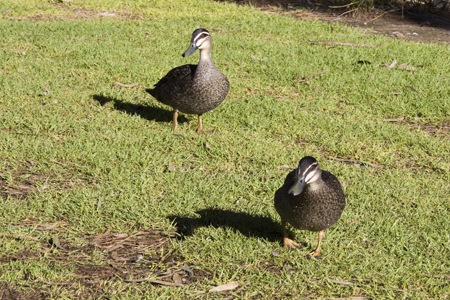 We ate at the same park as previously with two hopeful Pacific Black Ducks watching us closely. Other birds in the park this time were Mallard, Australasian Grebe, Red Wattlebird, White-plumed Honeyeater, and I think Eastern Rosella. From Burra we left our former path and headed south-east along the Goyder Highway towards Morgan, where we took a quick look at the Murray River. Instead of crossing here we continued on the Goyder Hwy / Renmark Road as far as the Taylorville Road turn-off and approached Waikerie from the north. 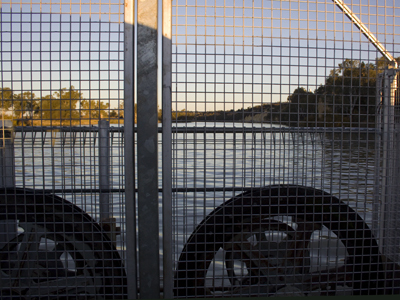 It was only a brief wait at the Murray for the free 24hr-a-day ferry over the river. Far more fun than a bridge. That being said, the Murray Bridge bridge that we crossed on the second day of our trip was nothing if not spectacular. 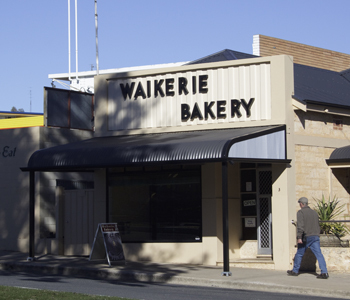 I’ve been wanting to go to Waikerie for years, mainly as a stopping point on the way to Gluepot Reserve, though hadn’t expected my first visit to be from the north over the Murray. It was becoming a habit for our overnight stops, but our Waikerie cabin was virtually on the road. Luckily there was little traffic. Before dark we took a walk around the park to make ourselves at home. Lots of tall trees make a real difference to a place. Overight we stayed warm in our cabin. The morning outside was cold with frost. 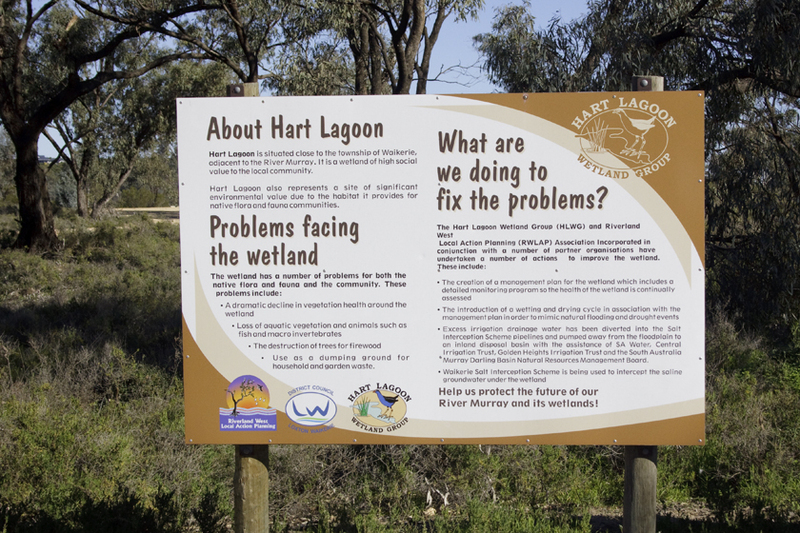 Hart Lagoon is opposite the caravan park. Here we saw Australian Pelican, Black Swan, Pacific Black Duck, Australian Wood Duck, Silver Gull, Whistling Kite, Galah, Red-rumped Parrot, Crested Pigeon, Kookaburra, Noisy Miner, Striated Pardalote, Magpie-lark, Pied Butcherbird, Australian Magpie, and numerous Welcome Swallows flying close around us at little more than head height. 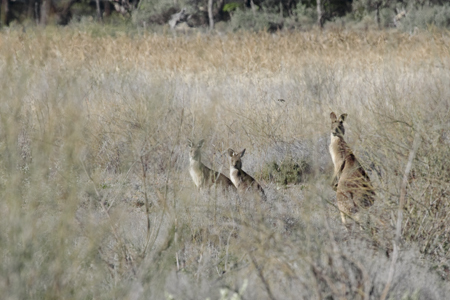 There were live Kangaroos, not corrugated as in Orroroo. Other Waikerie birds were Yellow Rosellas and a flock of Black Cormorants. In the town, next stop was the bakery and the Information Centre opposite. The latter was once the Lands Office and is now a work of art containing other art works, books and such for sale along with free information pamphlets. On we drove, buying petrol then eating morning tea at Renmark before crossing the border into Victoria. Travelling east on the Sturt Highway, we passed the road to Neds Corner and then Lake Cullulleraine, where we stayed a few years ago. Being starved of fruit, we bought wonderful juicy oranges and lemons at an orchard near Red Cliffs. This was so much better than going to a supermarket. Supermarkets are part of another world, to be avoided when possible, though admittedly very handy at times. Lunch stop was by green ovals at Red Cliffs where there were 1000 (read lots of) Galahs in two patches of shade. Hurrying on without delay we made Hattah Lakes just before sunset. It would have been very sad to miss this wonderful National Park. A longer stay would be preferable, but a short visit was much better than nothing. 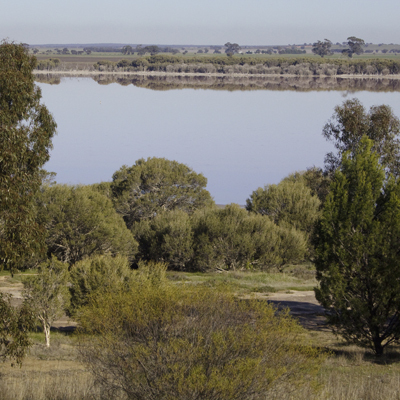 Years ago at Hattah we observed millions of tiny River Red Gums growing like a ring of grass around the receding lake waters. These once tiny seedlings now form a wide ring of trees around the lake. Further out than this ring is another one of much sparser, very old, large trees, presumably from a greater flood in the distant past. Hattah was very peaceful after the rush to get there. In the late light, the lake glowed. In the water were Pelican, Pacific Black Duck, Chestnut Teal, Red-necked Avocet, and Black-winged Stilt. Nearby there were Sulphur-crested Cockatoo, Little Corella, Galah, Masked Lapwing, Magpie-lark, Australian Magpie, and a raptor, perhaps a Whistling Kite. A small flock of Regent Parrots made a brief appearance. White-winged Choughs demonstrated loudly as we returned to our car. Our overnight accommodation at Ouyen was simpler and smaller than expected. At least it was well back from the main road. Being in no real hurry to return to Melbourne and particularly wanting to arrive after the evening peak traffic, we took a detour via Patchewollock. 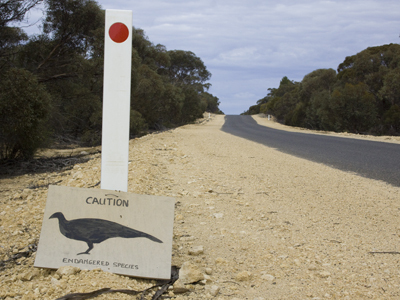 The aim was to travel very slowly (<40kph) down the Ouyen-Patchewollock Road in the hope of seeing Malleefowl. There have been various reports of them here in the not-too-distant past. Not being sure exactly where to look, we were glad to see signs about them by the road. ... but fortunately, travelling so slowly meant that we avoided a collision with an Emu that fled wildly through a gate to our left then across the road straight in front of us and into a paddock on our right. Apart from that near miss, the drive to Patchewollock was peaceful, with varied views of bushland and farm. 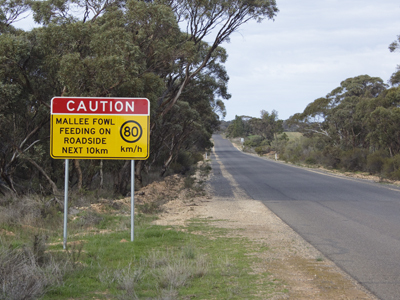 On arrival in the town, we were greeted by the sight of a pair of enormous Malleefowl. In contrast, numerous tiny Tree Martins perched on the overhead wires nearby. Other birds in the town included Rock Doves, Willie Wagtail and Grey Shrike-thrush. After leaving Patchewollock, we took the Sunrasia Highway towards Melbourne instead of going on to the Calder. This was an excellent choice as the road was quiet and pleasant with little traffic. 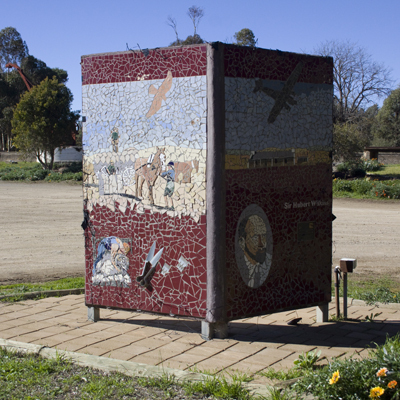 At the town of Birchip, the public toilets smelt so ‘clean’ I could hardly breathe. Sweet, sickly and overpowering. Such overuse of chemicals is totally unnecessary. Think of the pollution in their manufacture, and they all eventually enter the wider environment. Overuse of cleaning chemicals has been implicated in the emergence of resistant bacteria as well as human health problems relating to allergy and immunity. Most public toilets we visited were fine. These were the worst by far. 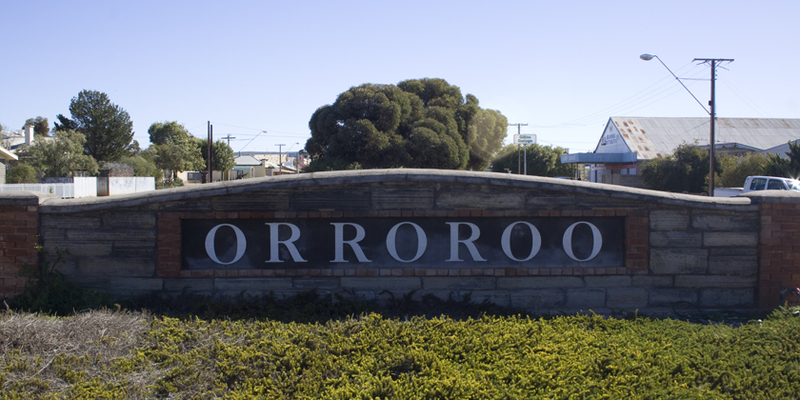 The best were at Orroroo; definitely worth a visit, even if you don’t need to. The weather was changing. The beautiful days of sunshine were over. 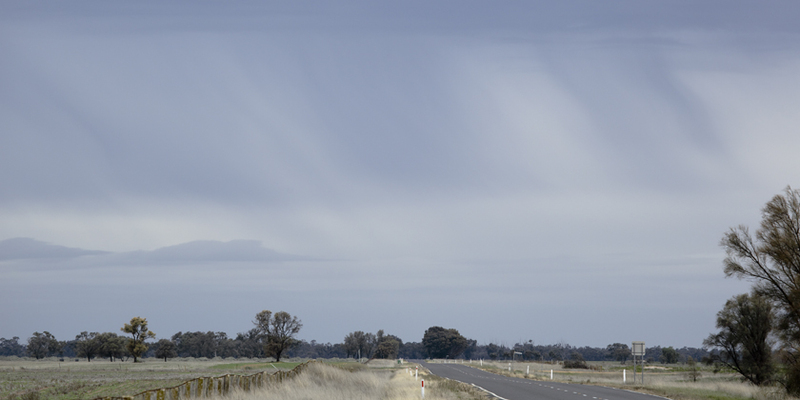 Between Birchip and St Arnaud we stopped more than once to photograph the sky with clouds of different types and bands of virga. The wind blew biting and strong. Late lunch was at Pioneer Park in St Arnaud. A small caravan park on the hill behind us overlooked the town. An attractive place, St Arnaud deserved a longer visit. Near sunset we stopped to view Waubra wind farm. To the west, turbine blades turned slowly. To the east, one end of a rainbow appeared to touch the ground. Light rain lashed us in the gusting wind. 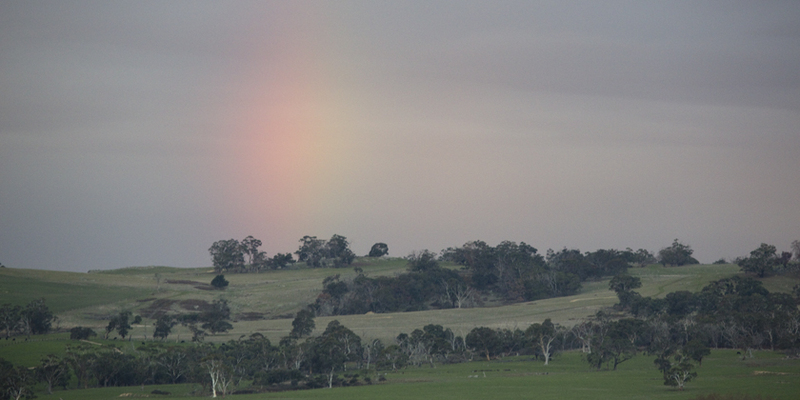 By the time we reached Ballarat (once Ballaarat), early evening was dark and cold. 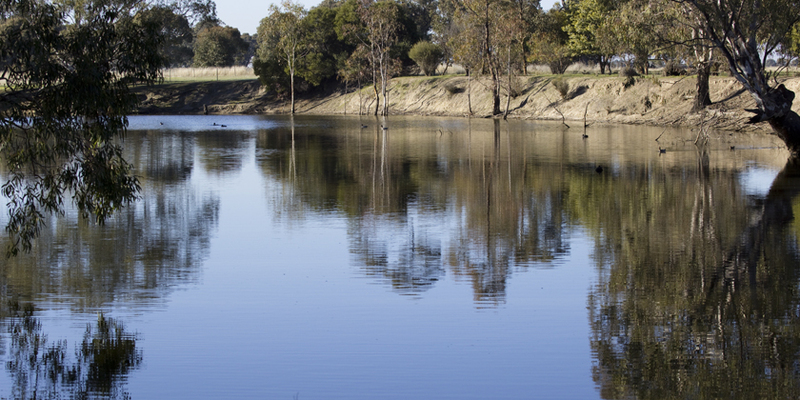 Instead of bypassing this city as we had on our outward journey, we joined the busy traffic on one of the entrance roads and found Lake Wendouree. We stayed in the warmth of the car to have something to eat and a hot drink while we watched broken reflections in the dark and wind-chopped water. We were home by about 7.30.